A Brights Community Cluster (BCC) can be a local group of Brights dedicated to the aims and principles of the Brights movement. Members generally stay in communication with one another both electronically and in person. 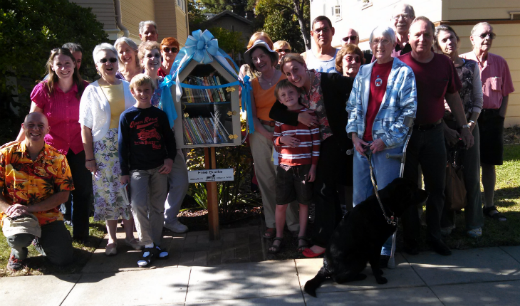 A BCC constructs, opens, and operates a little free library. Make available books for children featuring nature, investigation, invention, critical thinking and some excellent morality tales… For adults, top notch fiction and nonfiction… A library accessible 24/7, outdoors, and operating on the honor system – Why not? That was the thinking of a small Brights Community Cluster (BCC) in Sacramento (USA). And so they did it. 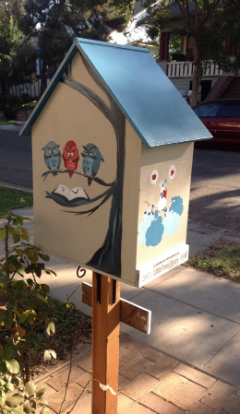 Participants got the idea from a website (littlefreelibrary.org) that has many suggestions for such a project.. They used another website (meetup.com) to arrange work sessions (usually followed by refreshment and camaraderie at a local pub). Productive fun, and something worthwhile for Brights to do! 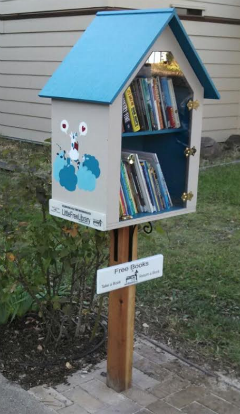 Across several monthly meetings in 2013, the BCC brought into being a tiny neighborhood free library. Members built it from scratch (with some expert guidance from one member, a civil engineer). They weather-proofed, painted, installed and stocked the two shelves with books. They had a grand opening with announcements, refreshments, ribbons, balloons, and Brights bookmarks. A positive Brights action. A proud achievement.